Surfy, fun, and consistent riding. With obscured skies and low visibility, thank goodness! 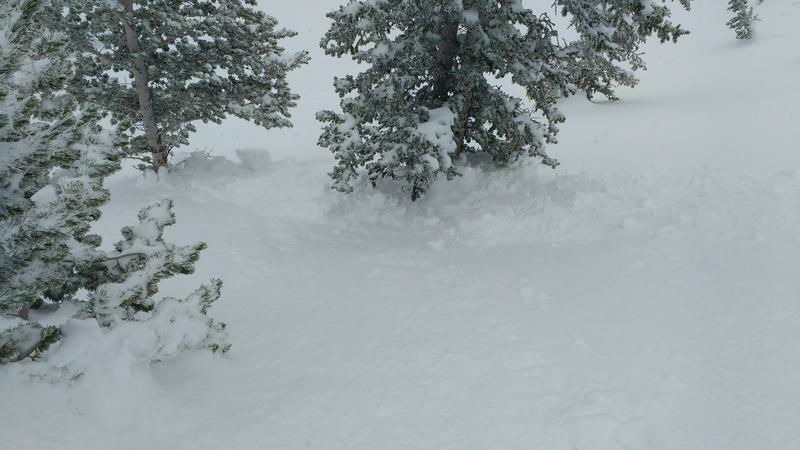 We had the benefit of tree's in Two Dogs, Upper Days and Main Days, but Toledo Bowl would have been a blind nightmare with anything less than predictable powder. 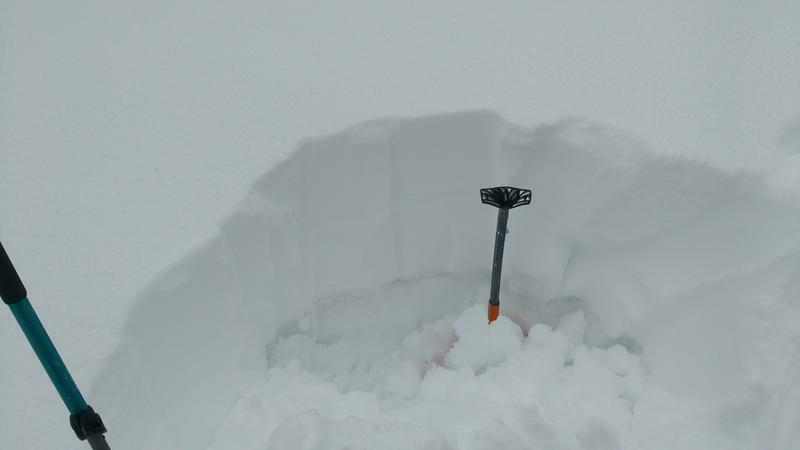 In upper elevations there were a frew scratchy areas where wind had scoured the snow down to the old crust. Skiing improved on the descent, as we left the bottom-feeding up top. 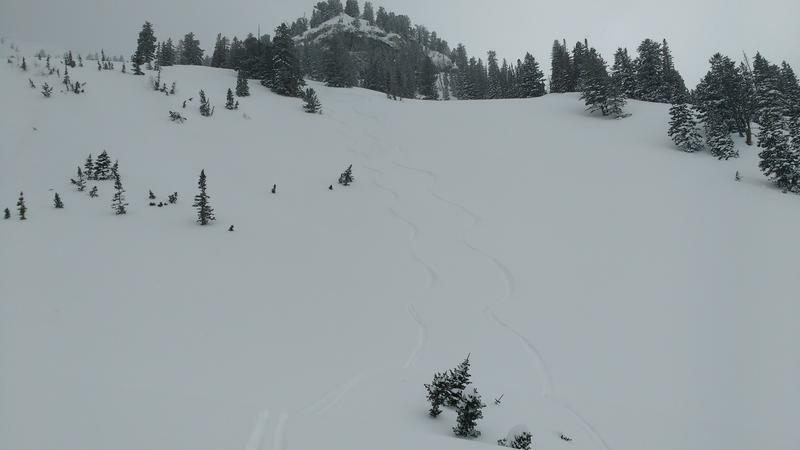 Despite moderate to strong northwest winds overnight and storm totals of 35" reported for upper Little Cottonwood, it seemed safe to ski almost anywhere. We were able to pry-loose a couple small pockets (15' wide and 8-12" deep) but only on very steep rolls . We did hear of an 20" deep 100' wide slide on high elevation east; a reminder that stubborn doesn't mean impossible. Today was less sensitive than yesterday. The weakness from yesterday's shallow touchy slides and todays deeper, more stubborn slides might not even be a player tomorrow. With winds decreasing through the night and blowing lightly on Friday, new snow drifting should be limited. Wet snow was not a problem between 8,800' and 10,500'. Cloud cover and temps in the low 20's kept the new snow cool. The melt-freeze and rain layer that was the surface at the beginning of the storm is now buried under a thick blanket, and it has cooled since yesterday. A frozen crust of varying thickness sits on top of damp melt freeze grains, but we saw no signs of water pooling in quick hand pits. 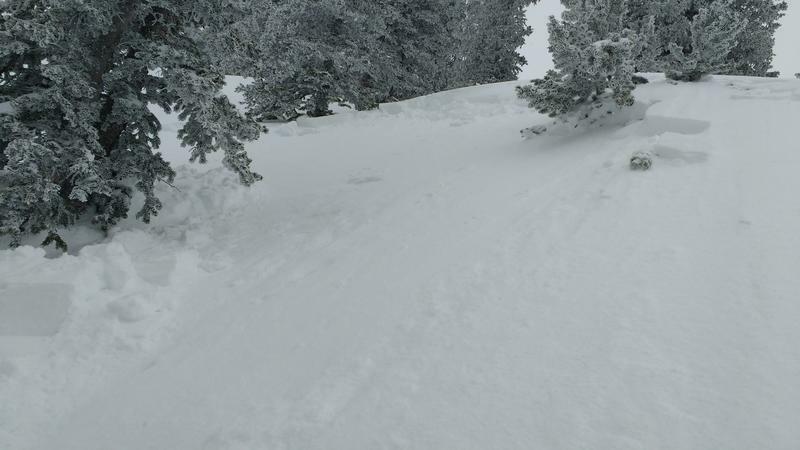 As for lower elevations: It looked like there might be some wet debris at the bottom of north facing mid-canyon couloirs, but visibility was limited. Avalanching was limited to very steep slopes. The small slide in the picture is from Main Days. This picture is really just to show off what a good storm we had! 15" to 35" of wintery snow on top of more "spring like" wet snow. Few out sampling the snow; fresh tracks on the way up and down!